HideMyAss is popular VPN provider with the biggest network of VPN servers. Unfortunately, the app is collecting some user's logs and 30-day money back guarantee comes with restrictions. HMA VPN also supports advanced features like Kill Switch or IP Shuffle. HideMyAss, sometimes shortened to HMA, is a well-known brand and one of the pioneers among VPN services providers. Operating since 2005, along the way it was acquired by AVG Technologies company and currently is owned by Czech security company Avast Software. As for main benefits, we can definitely mention that it’s the biggest VPN network (uses 840+ VPN servers in 320+ locations covering 190+ countries), has a very intuitive and friendly interface, and last but not least is a cool brand :). HideMyAss VPN works on any standard device including Internet-enabled TVs and games consoles. You can connect to five devices at the same time. Another happy moment came when we tried to use HideMyAss live chat. The agent was friendly and very helpful. On the other hand, their 30-day money back guarantee comes with restrictions such as limited bandwidth up to 10GB and a maximum of 100 available connections to the service. On the flip side they’ve started offering 7-day Free Trial (credit card is needed though). Unfortunately, HideMyAss collects some users’ logs. Pricing & Discounts – How much does HideMyAss cost? HideMyAss starts at $11.99 per month. If you are seeking an extra discount, go for 1-year protection for $83.88 that will save you $60 per year and is the highest currently available discount. You can easily check the service before spending any money, because HideMyAss offers 7-day Free Trial trial, although a credit card is required. Be aware that at the end of the Free Trial they will automatically start to charge you for the subscribed plan. HideMyAss offers also a great free tool called HMA! Free Web Proxy, which allows you to bypass all content restrictions and allows you to browse websites anonymously, without showing your real location (your IP address is hidden) to anyone – completely free of charge! How to use Free Web Proxy and what extra features does this tool offers you can see in our Free Proxy Guide. Also auto-renewal subscription is enabled by default. If you want to change it, you have to go to your online account and modify it via the control panel. User Interface – Is HideMyAss easy to use? Windows client has the same cartoon branding as we can see on HMA’s website. Navigation is quite simple and intuitive. The application’s interface is divided into three main sections. The Instant Mode, the quickest way to set up the secure connection will auto-connect you to the optimal server chosen by HMA. The Location Mode allows you to choose almost any location you desire, even right down to the city. The Freedom Mode with one click connects you to the nearest server in a country with free speech. Some users might find this feature handy, but for most of them will be obsolete and maybe in some cases not fully understood. For a long time, HideMyAss did not offer a Kill Switch feature, but that was changed with the recent version 3.5.10. This feature is accessible via settings. 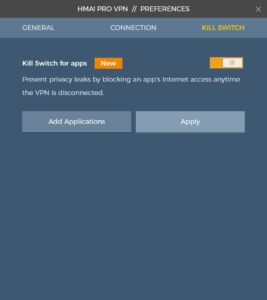 From May 2018, Kill Switch is available also to Windows and macOS products. Besides the Kill Switch HMA VPN also support IP Shuffle, another great feature which automatically changes your visible IP address by connecting to different VPN servers in the same location. IP Shuffling has been added in May 2018. HideMyAss uses 840+ VPN servers and 93,000+ IP addresses in 320+ locations covering 190+ countries – and we can call those some really impressive numbers, making this service unique among the other providers. We think it’s pretty safe to say that no other competitor can compete with HideMyAss in a number of provided locations. On the other hand, one possible improvement would be to inform users if the given location supports anonymous peer-to-peer connections. It’s also worth mentioning that from 2018, HMA servers are using so-called Full Disk Encryption. That means they are fully protected against any physical manipulation or attempts to access them. For example against physical raids by law enforcement agencies. This is very cool and not many VPN vendors do have something like this. It’s like an additional assurance that any data which may be stored on the VPN server won’t get into someone else hands. Does HideMyAss Support YouTube, Netflix, Hulu, HBO GO, Amazon Prime, & BBC iPlayer? During our testing, HideMyAss worked well with YouTube, Netflix, Hulu, HBO GO, Amazon Prime, Google, Facebook, and even BBC iPlayer, which is currently the only working solution out there (based on our testing). HideMyAss also recently significantly improved streaming with their new IP Stickiness feature. See the complete guide how to watch BBC iPlayer abroad – outside UK. 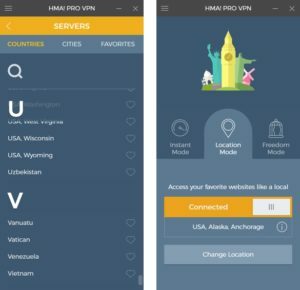 Concerning performance and internet speed connection, HideMyAss is definitely among the top 10 key VPN players. Anyway, as you can see the speed when connected to one of the HideMyAss VPN servers varied quite a lot. The benchmark with no VPN used was 31.71 Mbps, and the speed differed from 4.72 Mbps download in Australia to 22.05 Mbps in Moscow. HideMyAss Customer Support reaches a sufficient market standard. Even though there is no phone number you can call, there is still a handy live chat you can use as a regular website visitor. We did our homework, and we were positively surprised that even a technical issue we pretended to have was solved professionally and quickly. On the other hand, we noticed quite a lot of negative reviews on other forums related to issues with canceling auto billing and strict refund policies. 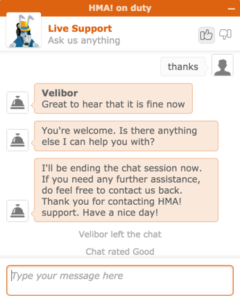 Overall we are giving 3 / 5 stars for Customer Support. Based on their Logging Policy, HideMyAss claims that they don’t store any activity or connection logs. Privax Ltd. is the parent company behind the HideMyAss VPN service and is based in London, England. The company was acquired by AVG and once again by Avast Software, a Czech security company with headquarters in Prague, Czech Republic. However, their CEO is from the USA. Conclusion – Is HideMyAss VPN worth $11.52 per month? HideMyAss is great VPN product which is easy to use and serves its purpose very well. If you are looking for a product with a wide range of available locations, high speed, and overall a cool user interface you can stop looking right now. The monthly price $11.99 sets this product among other top VPN providers who are more expensive than rest of the brands. But given all those extra features we are confident in saying that this product is worth the money. Unfortunately, HideMyAss collects some users’ logs and 30-day money back guarantee comes with restrictions such as limited bandwidth up to 10GB and a maximum of 100 available connections to the service.